After those long exciting days we still found time to chill at the pool and were sure thankful for our few earlier days after Epcot and Animal Kingdom to recover a little. I love that despite how much time may have passed cousins know how to pick up right where they left off. 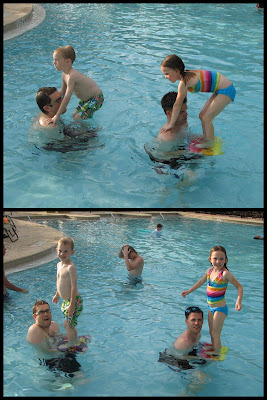 Uncle Skylar had them all laughing hysterically as they wondered who was going to get thrown in next. 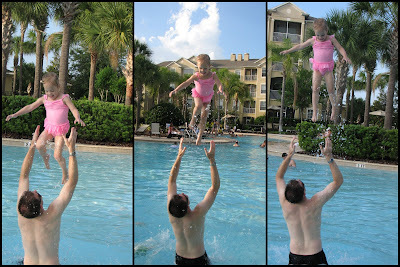 Lexi has learned to trust Daddy and became comfortable in her floaties. 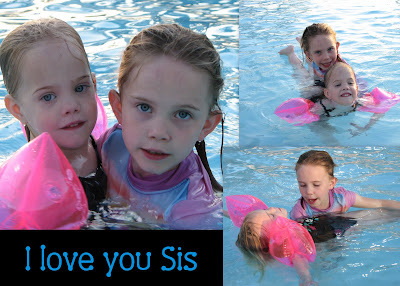 She loved paddling around all on her own but was willing to let Kylee be her own personal swimming instructor at times. As usual Skylar and I loved watching them be sisters together. These two as I mentioned before were inseparable and I was pretty impressed by even their surfing timing. I sure wish we lived closer and as always hated having to say good-bye but thanks guys for helping make the week even more fabulous and full of unforgettable memories. 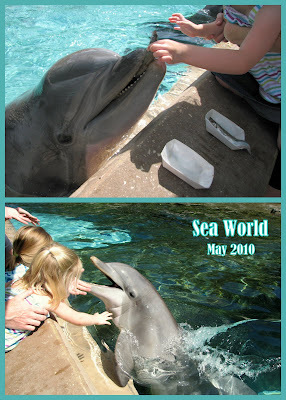 After Kevin's crew left we did fit in a day at Sea World which was a definite must especially with Kylee's love for dolphins. We had a fabulous time but do feel like it kinda got shafted. The kids were pooped and missing the cousins. They hung in there and had a good time but were ready to pack it up early and wanted time to hang out at the pool...both awesome things. We enjoyed the exhibits and seeing the shows which always touch your hearts. Each animal is truly magnificent and we can't wait to go back. The girls loved getting a chance to feed and touch the dolphins. Ky was shocked as she replied with, "Whoa, they are slimy!" She carried her souvenir dolphin around with her all day and can't wait to swim with them one day....we shall see! 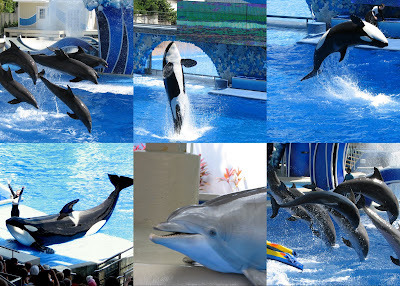 They had a great time hanging out by the tank with the baby dolphins and watched their own little show for awhile. The trip was fabulous and left us wanting more. The girls constantly ask to go back and are still talking about memories or little things they remember. When Alexis saw a picture of the temple the other day she asked, "Where are the fireworks" Gotta love that my little girl thinks a temple is Cinderella's castle and wants the firework show again. Ky has loved this and continues to show Lex her temple picture trying to explain...my solution, let's just go back. Kylee's relationships with Easton and Lexi both are really precious. Great pictures capturing special moments. All the little kids are growing up too quickly! Way to go on pulling off the dream come true trip and a great blog entry! I am exciting for a little cousin bonding next week in good old Idaho and to see your girls swimming skills.